University of Chicago Press, 9780226797625, 400pp. Coevolution—reciprocal evolutionary change in interacting species driven by natural selection—is one of the most important ecological and genetic processes organizing the earth's biodiversity: most plants and animals require coevolved interactions with other species to survive and reproduce. The Geographic Mosaic of Coevolution analyzes how the biology of species provides the raw material for long-term coevolution, evaluates how local coadaptation forms the basic module of coevolutionary change, and explores how the coevolutionary process reshapes locally coevolving interactions across the earth's constantly changing landscapes. Picking up where his influential The Coevolutionary Process left off, John N. Thompsonsynthesizes the state of a rapidly developing science that integrates approaches from evolutionary ecology, population genetics, phylogeography, systematics, evolutionary biochemistry and physiology, and molecular biology. Using models, data, and hypotheses to develop a complete conceptual framework, Thompson also draws on examples from a wide range of taxa and environments, illustrating the expanding breadth and depth of research in coevolutionary biology. 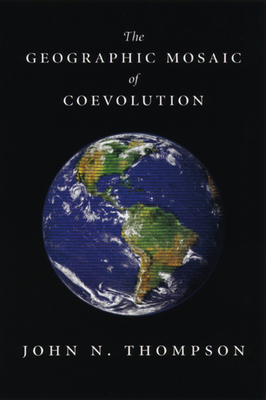 "In The Geographic Mosaic of Coevolution, John Thompson provides an invaluable synthesis of empirical evidence for coevolutionary processes in a wide range of interactions, a compelling case for the importance of understanding these processes in both natural and human-altered systems, and a conceptual framework for conducting studies on coevolution. . . . The Geographic Mosaic of Coevolution is an important and intellectually satisfying work that should appeal to a broad range of biologists." "Thompson's emphasis on the implications of spatially varying selection will help us to better understand the evolution of interspecific interactions. His fieldwork and his theoretical collaborations will be cited for many years to come. There is no more authoritative source for the latest research in one of the most important areas of evolutionary biology." "John Thompson has arguably contribuded more to our understanding of coevolution than has any other living scientist. . . . There is no doubt that Thompson's emphasis on the implications of spatially varying selection will help us to better understand the evolution of interspecific interactions. His fieldwork and his theoretical collaborations will be cited for many years to come. There is no more authoritative source for the latest research in one of the most important areas of evolutionary biology." "[The book] shines in presenting gorgeous theoretical work supporting the geographic mosaic theory of coevolution. . . . Read this book. Savor the intricate details and appreciate the marriage of nascent data with nascent theory. If the devil is in the details, then this book will certainly please." "All with an interest in evolution and ecology must consult this book, if only to scrutinize how the Geographic Mosaic grapples with an awkward dichotomy that is too frequently ignored in evolutionary ecology." "This book is clearly essential reading for both ecologists and evolutionary biologists studying species interaction and coevolution. It offers a very comprehensive review of the state of the art for coevolutionary studies. In fact, there is no other book available with such a thorough and extensive review across taxa and across the full range of coevolutionary interactions." "Given its attempt to understand coevolution at all levels, from viruses and hosts to lions and their prey, The Geographic Mosaic of Coevolution belongs on everyone's bookshelf." "For ecologists focused on the importance of species interactions to the conceptual issues of community theory, the book is a wealth of new ideas. . . . Thompson's fundamental goal is to squarely identify the process of coevolution as a foundational biological principle. I think he succeeds." "The strength of Thompson's monograph lies in his painstaking descriptions of the rich natural history of coevolving organisms and the geographic variation in their interacitons. He leaves no doubt that geography does matter for an array of topics."